A PDP source said: “Our leader has taken the senatorial ticket away from the governor because he cannot afford to take any risk. The slot is now for the present occupant of the seat, Sen. Abdulrafiu Ibrahim. What we are trying to do is to give the governor a soft landing. We do not want it to appear as if the governor is being humiliated. To get the ticket, the governor sent emissaries to our leader. It has now turned out that the shoe is bigger than him because 2019 poll is really testy for us. A separate statement by the State Publicity Secretary of PDP, Tunde Ashaolu, confirmed that the party was weighing options on the demand of Ibolo people to give a second term ticket to the incumbent Sen. Abdulrafiu Ibrahim. 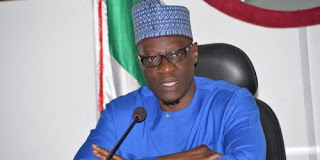 The statement said: “The attention of the Peoples Democratic Party (PDP) in Kwara State has been drawn to a misleading media report insinuating that there is panic in the camp of Senate President, Dr Abubakar Bukola Saraki and that Governor Abdulfatah Ahmed is under pressure to withdraw from the Kwara South senatorial race as a result of the aftermath of last Saturday’s by-election in Ekiti/Oke-Ero/Isin/Irepodun federal constituency. “This is totally untrue, ridiculous and a deliberate mischief orchestrated by some unscrupulous elements and political jobbers who are bent on causing confusion within the party and among our leaders. For the avoidance of doubt, there is no tension whatsoever within the fold of the PDP in Kwara State and there is no pressure on Governor Ahmed to drop his senatorial ambition because of the outcome of the recently held bye-election in the state. “The party however, notes that there are ongoing consultations and pleas by leadership of the Ibolo axis of Kwara South, where the current senator representing the senatorial district, Dr Rafiu Ibrahim hails from, for the party’s senatorial ticket to be retained in the axis in the interest of fairness and equity in the distribution political offices within the district. “It is instructive to note that these consultations and pleas preceded the November 17 by-election and are based on the understanding that the Igbomina and Ekiti divisions of Kwara South had produced senators who served two terms in the Senate as opposed to the Ibolo division whose representative had only served one term. “This was the sole observation raised by the stakeholders during all their consultative meetings with the national leader of our party and Senate President, Dr Abubakar Bukola Saraki, Governor Abdulfatah Ahmed and other leaders of the PDP in the State. “It is, therefore, ridiculous for anybody to think that the outcome of an election that does not reflect the will of the people, as it was marred with widespread irregularities including intimidation of voters, ballot box snatching and illegal arrest of PDP members, could lead to the withdrawal of Governor Ahmed from the senatorial race. “The party thereby urges members and supporters of the PDP as well as the general public to disregard the fake report which was sponsored and planted in the media by unscrupulous elements and fifth columnists. “Ahmed is a prominent leader of our party and has always placed the party’s interest above his personal interest. More so, he has provided exemplary leadership since he assumed office in 2011 and has created enduring legacies that have placed Kwara on a path of sustainable development. “Among the enduring legacies of Governor Ahmed, which are products of foresight and vision, are the establishment of the Kwara State Internal Revenue Service (KWIRS) and the Kwara Infrastructural Development Fund (IF-K). Without doubt, these initiatives have had great impacts on the development of the State.